Language allows us to face novel concepts and situations by building structured mental representations of the world. The primary goal of my research program is to use computational models and behavioral experiments to understand how we construct and update these rich mental models both from experience (i.e., language acquisition) and from language (i.e., language processing). In this talk, I draw on methods in computational linguistics and computational cognitive science to propose a model of lexical acquisition formalized as logical program induction. First, I’ll illustrate how the model explains the systematic patterns of behavior observed in children as they acquire kinship words. Then, I will present a large cross-cultural data analysis model that infers how children use data from the timing of their lexical acquisition. Lastly, I will use children’s acquisition of exact number words as a case study to demonstrate how both of these models can be combined to learn about the universal and culturally-specific processes of the human learning machine. Taken together, this body of work provides the first computational model for how children learn relational word meanings, the first large-scale cross-linguistic model of children’s data usage during early word learning and an innovative computational toolbox for leveraging large datasets and discipline knowledge to draw theoretical insights in child development. This week, Bing’er will be leading a discussion on Feldman et al.’s (2013) A Role for the Developing Lexicon in Phonetic Category Acquisition. P* Group will take place in room 002 of the Linguistics Building, from 11 am until noon. All are welcome to attend! Published by McLing on November 12, 2018 at 2:50 am under Uncategorized. This Friday, Jason Borga will be leading a discussion on Rudin’s (2018) “Head-Based Syntactic Identity in Sluicing”. As usual, the meeting will take place in Room 117, from 3pm to 4:30pm. All are welcome to attend! Published by McLing on November 12, 2018 at 2:20 am under Uncategorized. Congratulations to Luis Alonso-Ovalle, Junko Shimoyama, and Bernhard Schwarz who have been awarded an SSHRC Insight grant for their application Modality across Categories: Modal Indefinites and the Projection of Possibilities! Published by McLing on April 3, 2018 at 4:57 pm under Uncategorized. Published by McLing on January 29, 2018 at 2:00 am under Uncategorized. Sharon Goldwater from the University of Edinburgh will be giving a talk entitled Bootstrapping Language Acquisition as part of the McGill Linguistics Colloquium Series on Friday, January 12th at 3:30pm in room 433 of the Education Building. All are welcome to attend! For the abstract and for any other colloquium information, please clear here to visit the Colloquium Series web page. Published by McLing on January 8, 2018 at 10:48 am under Colloquia, Uncategorized. BA student Paulina Elias and PhD student Justin Royer traveled to Toronto to present their work on Chuj at the first Toronto-Ottawa-Montreal Indigenous Languages of Latin America (TOMILLA) workshop at the University of Toronto. Paulina’s talk was “Positionals and directionals in Chuj” and Justin’s was “Noun classifiers, (in)definiteness, and pronouns in Chuj”. Published by McLing on November 27, 2017 at 2:00 am under Uncategorized. Congratulations to Donghyun Kim, Meghan Clayards, and Heather Goad for the acceptance of their paper “A longitudinal study of individual differences in the acquisition of new vowel contrasts” by the Journal of Phonetics. Published by McLing on November 20, 2017 at 11:38 am under Uncategorized. McLing summer news, final edition! Jurij Bozic will attend Roots V at Queen Mary, University of London (17-18th June), where he will give a talk with the title “Roots and Non-Locally Triggered Allomorphy”. He will also spend several weeks in Slovenia eliciting judgements from native speakers on several topics that he is currently researching. September Cowley has completed her M.A. at McGill and will join UC San Diego’s Linguistics department to begin her PhD this fall. Henrison Hsieh has been spending some of the summer presenting joint work with Luis Alonso-Ovalle at various conferences, including the upcoming Workshop on the Semantics of African, Asian and Austronesian Languages (TripleA 4) in Gothenburg, Sweden. In July, he will be attending the LSA Summer Institute at the University of Kentucky in Lexington, KY.
Goad, H., L. White, G. Garcia, N. Guzzo, M. Mortazavinia, L. Smeets & J. Su. 2017. Effects of pause and stress on pronoun interpretation in L2 Italian. Paper to be presented at the International Symposium on Bilingualism (ISB 11), University of Limerick, June 2017. Goad, H., L. White, G. Garcia, N. Guzzo, M. Mortazavinia, L. Smeets & J. Su. 2017. Pronoun interpretation in Italian: assessing the effects of prosody.​ Paper to be presented at the Experimental Psycholinguistics Conference, Menorca, June 2017. Published by McLing on May 22, 2017 at 1:50 am under Conferences, Student news, Uncategorized. Published by McLing on April 18, 2017 at 1:50 am under Uncategorized. 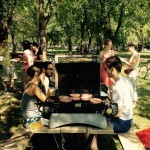 Published by McLing on September 8, 2015 at 1:50 am under Uncategorized. 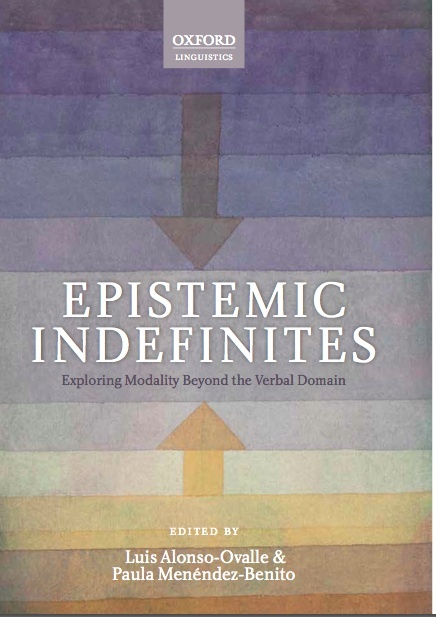 Epistemic Indefinites: Exploring Modality Beyond the Verbal Domain, a collected volume edited by Luis Alonso-Ovalle and Paula Menéndez-Benito has just been published by Oxford University Press. Congratulations to all contributing authors and to the editors! Published by McLing on May 4, 2015 at 2:00 am under Faculty news, Publications, Uncategorized. McLing is collecting news about what members of the McGill Linguistics community––students, graduates, faculty, etc.––are up to this summer. Please send us your news! Barbara Coelho plans to dive in to learning Scottish Gaelic this summer. Besides that, she will be researching her plan to apply to a Speech Pathology MA. Emily Goodwin will be volunteering this summer in the MIDC (McGill Infant Development Centre) and taking a CompSci course. Hannah Cohen, Maggie Labelle, and Madeleine Mees will be working as summer interns at Nuance here in Montreal. Maggie and Madeleine will be part of the User Interface Design team, and Hannah will be part of the Speech Science team. Hye-Young Bang will be attending the LSA Summer Institute in Chicago, and presenting at the International Conference on Korean Linguistics in Chicago and the International Congress of Phonetic Sciences (ICPhS) in Glasgow. Gui Garcia will be finishing a book chapter on the prosody of English acquisition of Quebec French with Natália B. Guzzo; teaching an intro course on R to a research group at UFRGS in Brazil; and doing some fieldwork in the the Italian Immigration Area in southern Brazil. From there, he heads to the second session of the LSA Summer Institute. Daniel Goodhue is also heading to Chicago for the LSA Summer Institute. Oriana Kilbourn will also be attending the LSA Summer Institute, and presenting at ICPhS in Glasgow as well. Jeffrey Klassen is going to the Discourse Expectation Conference (DETEC 2015) in Edmonton, Alberta (June 17-19) to present a talk, joint with Annie Tremblay: “Anticipatory focus: Processing, transfer, and grammatical architecture in L2”. Published by McLing on April 27, 2015 at 1:50 am under Uncategorized. McGill linguists will travel to Vancouver for WCCFL 33 later this month, to be held at Simon Frasier University. Heather Goad will give a plenary talk titled “Phonotactic evidence from typology and acquisition for a coda+onset analysis of initial sC clusters“. PhD student Guilherme Duarte Garcia will give a talk “Stress and gradient weight in Portuguese.” Here is the rest of the program. In April, PhD student Michael Hamilton and post-doctoral fellow Hadas Kotek will both head to Paris for GLOW. Mike’s talk will be “Feature Inheritance in clausal and verbal domains: Evidence from Mi’gmaq”, and Hadas’s is titled “Intervention everywhere“. The full program can be found here. Published by McLing on March 9, 2015 at 1:50 am under Postdoc news, Student news, Uncategorized. Published by McLing on February 9, 2015 at 1:50 am under Uncategorized. Brian Buccola made a presentation last Friday on Al-Khathib (2013) ‘Only’ and Association with Negative Antonyms. Ph. Diss. MIT. He will continue the presentation on Friday 27 at the Syntax-Semantics Reading Group (room 117, from 3:00 to 4:30). 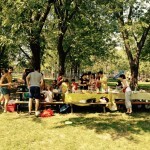 Published by McLing on June 23, 2014 at 2:00 am under Uncategorized. Published by McLing on June 2, 2014 at 2:00 am under Uncategorized. This course can be taken for graduate credit by linguistics graduate students, provided they register for it under a graduate level course number. viewed in the right way, the propositional calculus can be used to formalize the syntactic categories of natural language expressions. The Lambda calculus is a notation developed by Alonzo Church to represent all functions in mathematics. It is widely used by natural language semanticists to express the values which can be associated with the expressions of a natural language. It turns out that there is a deep and elegant connection between the Lambek calculus and the Lambda calculus, which natural language semanticists find very useful to exploit. This connection is known as the Curry-Howard isomorphism. Making all this clear as well as showing how these tools apply in an enlightening way to a variety of natural language expressions, including those involving coordination, quantificational expressions and comparative expressions, is what the course aims to do. The course presupposes nothing other than what is covered in the introductory logic course (PHIL 210). Anyone with this much preparation is welcome to enrol. Success in the course requires that one is at ease with, and not at all a whiz at, elementary logic and that one has the self discipline to work regularly at studying the material. Assessment is based on problem sets and class participation only. Last year, a student who was an undergraduate major in English at McGill University and had taken only the introductory logic course (PHIL 210), took this course and did extremely well. The same student, who has gone on to graduate studies in linguistics at Oxford University, reports that he is `ahead of the game’ as a result of this when he started his studies there. This fall will be the third time the course is offered. I shall be joined by Dr. Eliot Michaelson in teaching the course. Dr. Michaelson graduated from UCLA with a doctorate in philosophy and works in the area of philosophy of language. He is a Mellon post doctoral fellow in the Department of Philosophy. 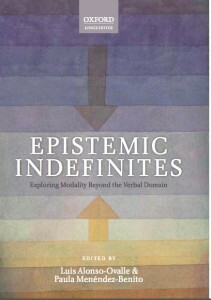 The course will continue to use Bob Carpenter’s textbook, Type logical semantics. This book, though it is an introductory textbook, is a little on the steep side. To ease the gradient, I have written notes designed to reduce the slope in going from the level of introductory logic to the Carpenter textbook. 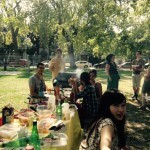 Published by McLing on May 19, 2014 at 2:00 am under Classes, Uncategorized.